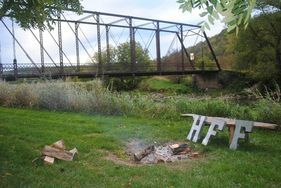 Hutchinson Family Farm Campground has spacious, natural riverside campsites for you and your family to enjoy. Both electrical and primitive campsites are available. 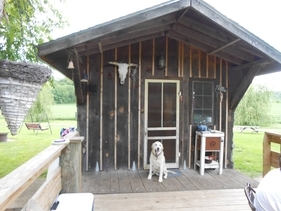 Each cabin offers a scenic view of the Upper Iowa River and has a refrigerator, microwave, and fire ring with grate which makes "roughing it" a pleasure. 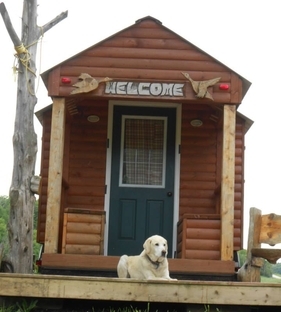 Although the cabins do not have running water, they are conveniently located near the modern shower and restroom. 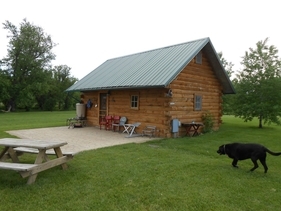 The large log cabin sleeps 6-8 people and has a large patio outside as well as dining room table and living room inside, allowing for wonderful gatherings rain or shine! The small cabin's trundle and bunkbeds sleep 3 people. Its oversized deck is built into the trees providing a private place to "get away from it all." As seen on T.V. Tiny Houses are the newest housing phenomena. Our Tiny House features a kitchen with sink, deck, and a dining room that converts into a queen bed.